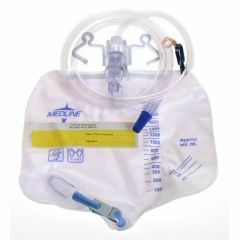 The Medline Drainage Bag features an anti-reflux valve and your choice of drainage port. The metal clamp is the standard in sureness. The slide tap is made for those who have limited dexterity and may not be able to use the metal clamp. Both are amazing choices. Features 50" extension tubing. Comes O.R. sterile. Heavy duty tough plastic. Heavy duty tubing. Easy sliding drain tap. Convenient hooks to hang. Very long lasting. I forgot to close the tap. These bags have lasted several weeks before I've replaced them, and only because of sanitary reasons. The plastic is incredibly tough and durable, as well as the tubing. I haven't found a better night-time bag on the market yet.